One of this year's most controversial California voter initiatives is Proposition 6. Approved to appear on 2018 statewide ballot, if approved Proposition 6 would rollback gas taxes and vehicle registration fee increases approved and signed into law under Senate Bill 1. The No on 6 proponents has released a video today that will initially be aired in the Fresno TV market. 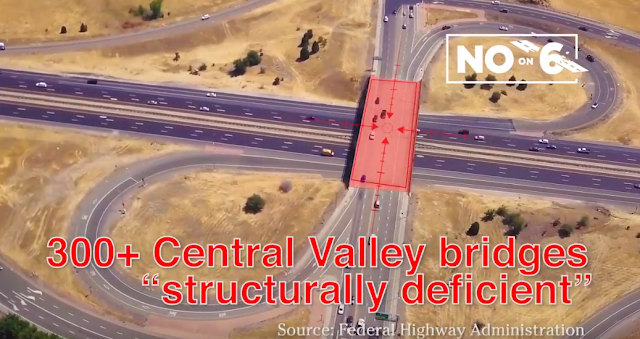 The YouTube video (posted below) target voters by claiming there are over 300 bridges and overpasses in the Central Valley that are "structurally deficient." The voiceover says "Proposition 6 attacks the safety of our local bridges and roads. It eliminates $2 billion in Central Valley Transporation funding." The narration also claims it would eliminate funding to Highway 99 and Interstate 5, vital freeways in the Central Valley. The effort to place the initiative on the ballot was led Carl DeMaio. If voters approve the proposition, gas tax, and vehicle registration fees increased mandated by SB 1 would be repealed, and it would mandate any gas sales taxes be approved only by voters. Supporters of Proposition 6 include Republican gubernatorial candidate Jonh Cox. The yes on 6 committee has reportedly received financial support from House Speaker Paul Ryan and Majority House Leader Kevin McCarthy. The video also highlights it has the support of California Highway Patrol officers and firefighters' unions. "Proposition 6 is a dangerous measure that could delay emergency response times and make our roads less safe by eliminating crucial transportation funding," Brian Rice, President of California Professional Firefighters said. "It's imperative that Central Valley voters understand the risk to public safety that Proposition 6 poses to our communities." Although members of the Elk Grove City Council have not formally stated their position on the proposition, the city has received funding from SB 1 for their most coveted transportation project, the Kammerer Road extension. The project will provide another connection between Highway 99 and Interstate 5 and is a crucial link for real estate developers hoping to build more houses in the southern portions of Elk Grove. I guess it all boils down to the apathetic commuters (excepting electric car drivers) who will pay this regressive tax, versus the folks who make money on highway construction (including developers who want the taxpayers to pay for their access corridors, and local politicians who want to puff their chests over 'their' accomplishments). Oh well, I'm one of Suen's pre-2006 freeloader homeowners who was never going to see street improvements in my neighborhood anyway!